Here’s the third instalment in our Four Days In Paris series and I will admit right up front that four days of shopping in Paris is not going to appeal to every traveller. In fact, I’m guessing that some of Distant Francophile’s most loyal readers have just stopped reading. And I’ll also admit that it if it is your very first visit to Paris, you are probably not going to spend your entire stay shopping. It’s more likely that you will sneak in a little shopping between people watching or visiting the big names. But if you’ve visited Paris before, or you are not into museums, architecture and art, it’s entirely possible to spend days doing nothing but shopping. In fact, truth be told, I’m planning to do exactly that when we visit Paris for two days next month. However, I do need to define exactly what I mean by shopping. Firstly, shopping and buying are not the same things. And secondly, I’m a firm believer that shopping can actually equate to a cultural experience. Let me explain what I mean with some examples. Watching what is purchased in the market will give you an excellent idea of how the Parisians eat. Poking around in Parisian homewares shops can give you great insights into what you might find in an authentic Parisian apartment. And do I even need to tell you what you might learn in all those little clothing and lingerie boutiques? So with cultural experiences in mind, here’s how I’d recommend spending some quality shopping time in Paris. Take our standard day one advice and spend some quality time exploring the arrondissement in which you are staying. Every Parisian arrondissement has a feel all of its own. For example, if you are staying near Montmarte in the 18th or the top end of the 9th, you’ll find amazing fabric stores sitting amongst discount stores. Turn the corner, and you are likely to find yourself in some sort of foodie heaven. Turn again, and you will find art supply stores. Eclectic yes, and great fun! In the afternoon why not head to Le Bon Marché at number 24 Rue de Sèvres, in the chic 7th arrondissement. While I’m sure you will be entranced by the very best of Parisian fashion, accessories, homewares and stationery (I never fail to buy a little something while I’m in the stationery department) make sure you don’t miss the stunning architectural features of the store. Head to the top floor to check out the ceiling (and the gorgeous floorboards), and don’t miss the stately staircases. Do not leave this part of Paris without heading across the street to Le Bon Marché’s sister store, La Grande Épicerie de Paris. This is one of my favourite Parisian destinations. La Grande Épicerie de Paris stocks food and lots of it. Pick up a little afternoon snack, something for your dinner or at the very least, some treats to take home. Chocolate, dried French tarragon and salt (of all things) always seem to end up in my basket. And if you are champagne lover, make sure you head into the cellar where the friendly staff often offer free tastings! If you are a fashion lover, this day is for you. But my first piece of advice for day two is to dress appropriately – you’ll want comfy footwear and a relatively stylish outfit! Our day starts in the centre of Paris at the Louvre. To get yourself in the mood, you might like to stop in at the Musée des Arts Décoratifs – a small, stand alone museum in the western wing of the Louvre – which has a fabulous fashion exhibition (amongst other things). Alternatively, you might like to jump straight in, and if so, head left and make your way to rue Saint-Honoré and the extension, rue du Faubourg Saint-Honoré. A stroll along these streets introduces you to some true Parisian icons. The Colette concept store, the Chantal Thomass lingerie boutique at number 221, Dani Roses, Hermès, Lanvin, E.Goyard and Longchamp are just a few of the names you will encounter. You will also take in sights like the Élysée Palace and Hôtel Le Bristol. Make sure you take appropriate detours along the way so you don’t miss the opportunity to window shop at Place Vendome or to visit the legendary Chanel boutique at 31 rue Cambon. If you happen to make a purchase – even something as small as a lipstick – it will come packaged in a white bag with a white camellia. The white packaging is reserved for the rue Cambon store only. Once you’ve had your fill, cut across to the Champs Élysées. 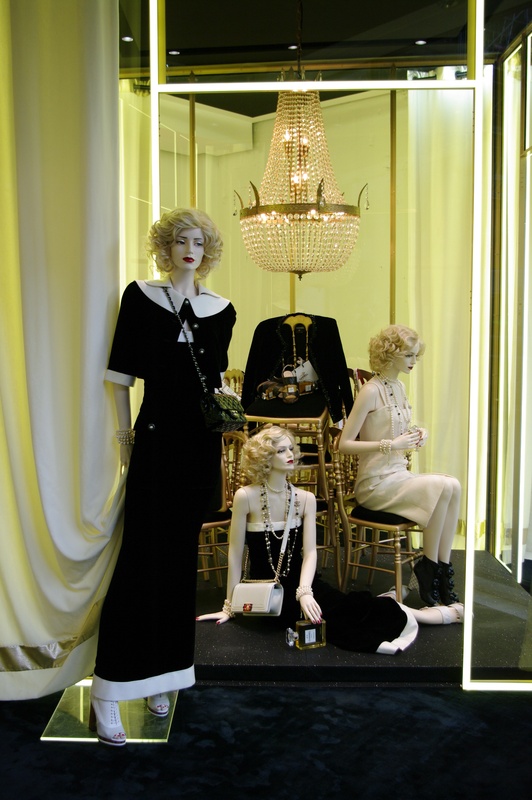 Yes I know that many consider it far too touristy (some also now say this about rue Saint-Honore) but there is so much to see – including the Louis Vuitton flagship store with its very own museum and the Guerlain boutique. For this particular day, I recommend you head towards the Arc de Triomphe on the right hand side of the road and head back down along the left hand side of the road so you can turn easily turn towards the river and into one of the most exclusive shopping strips in the world. Perhaps you’ll like to start this day on whichever side of the river you happen to be staying, but for the sake of writing this down, I’ll start on the left bank. 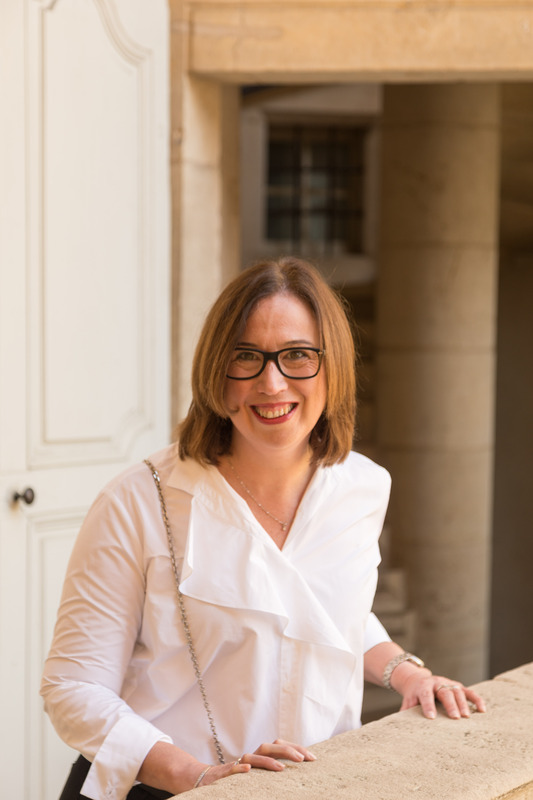 That way I will be able to recommend you end your day with a glass of champagne in Place des Vosges or the Palais-Royal, depending on which way you’ve wandered! The area that takes in two famous Parisian churches – Saint-Germain-des-Prés and Saint-Sulpice is also world renowned for its shopping. While you won’t necessarily choose to head in straight line, I promise you will enjoy exploring the narrow, atmospheric streets that feature shopping gems like the relatively new boutique belonging to super model Ines de le Fressange (we visited last time – its so cute), the exclusive lingerie boutique Sabbia Rosa, Buly 1803 stockists of some of the coolest body products anywhere and the iconic Diptyque store (which is a smidgen further away at 34 Boulevard Saint Germain). After you’ve taken in all the left bank cool, head across any one of Paris’ beautiful bridges to the Marais. Particularly lively on Sunday afternoon, the Marais is full of funky fashion and design shops which are fun to wander in and out of. You can even buy hand rolled artists pastels from Maison du Pastel if you happen to visit on a Thursday. And if beautiful sandals are your thing, don’t miss the K Jacques store at 16 Rue Pavée. Finish your day with the aforementioned champagne. It is not Parisian shopping trip without a visit to a French market. Market shopping in France will make you hate your local supermarket, but that is a minor inconvenience when compared to the experience of checking out the breads, meats, cheeses, seafood and all the other yummy items on offer. We’ve enjoyed several Parisian markets, but especially the markets at Bastille and Anvers. If you can’t time your visit to a nearby market you can also check out one of Paris’ famed ‘foodie’ streets. Rue Cler in the 7th and rue Montorgueil in the 2nd are both good options. After you’ve seen how well food can be done, why not finish your last day with one of the prettiest free views in Paris? Head to Galeries Lafayette in the 9th where you will find more high end buying opportunities as well as one of the prettiest domes in Paris! I recommend taking the escalators all the way to the top floor – so you can get better and better views of the stunning stained glass (pictured top) – before finally making your way up onto the roof for a fabulous view across the Paris skyline. And from this vantage point you will also get a really good idea of just how much of Paris you have seen in the name of shopping! 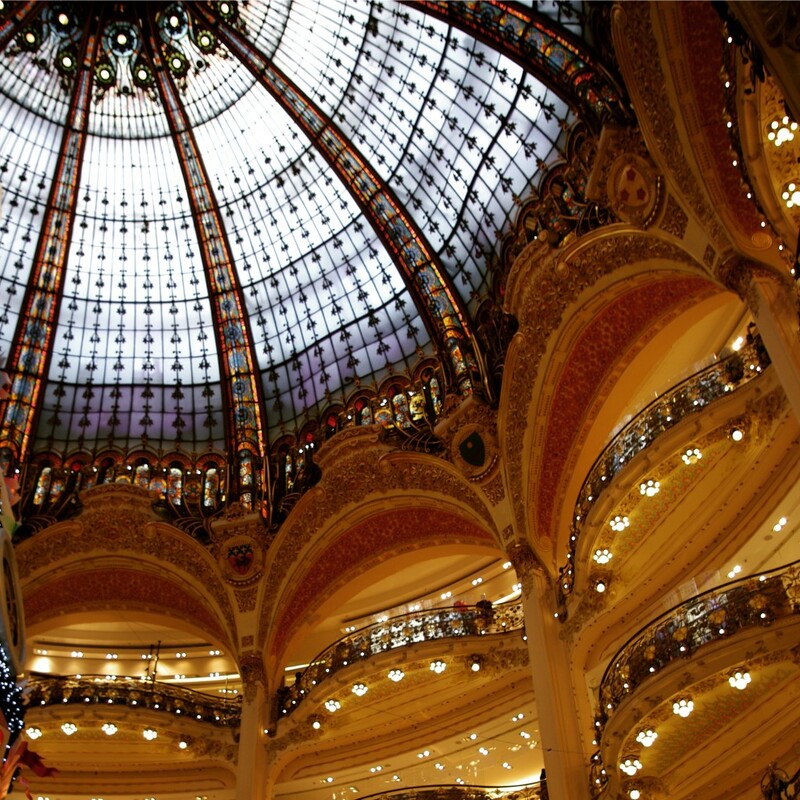 Do you have any super shopping tips for Paris? If so, I’d love for you to share every single one of them in the comments below. Thanks for this info, I was imagining I was in Paris as I was reading. I didn’t do a lot of shipping whilst in Paris but I did buy a little Limoges jewellery box from a small and gorgeous antique store I stumbled across. The lady who sold it to me said it was from around 1910. It’s a lovely treasure to keep. I also treated myself to a beautiful beaded and crystal necklace from a jewellery store on Rue de Rennes called Saoya. Thanks for the tip on Saoya Kylie. We are staying just near there on our next trip so I will definitely check it out. It’s funny the things you stumble on in Paris isn’t it? You can find the most delightful treasures without even trying!! I’m with you: no visit is complete without some shopping. In fact, my next trip to France will be to Lille, to visit the Christmas markets and do all of my Christmas shopping. I’m glad I’m not the only one Graham!! You and I must be thinking alike at the minute…we are doing a relatively (in Australian terms) quick visit to Strasbourg next month to do exactly the same thing. Enjoy your shopping adventure! !